"Love" token, awarded by dbarratt. It is used to get the above listed properties; however, because of (1), it does not always get the actual property. One example of where this could be a problem is in SpecialBlock::processForm, when updating an existing block. Flags set by default on the new block can be different from the old block due to how global configs interact with the old block's flags, even though the user performing the block didn't intentionally change them. This will be a problem if the global configs are ever altered after the block is updated. Once we separate these methods, then in contexts where we are really interested in the properties set on the block, we can use the get/setters, and know that the return value reflects the database. rECHU9f74efca4082: Localisation updates from https://translatewiki.net. rMWffb2ab7f54ab: Merge "Remove unused method Title::validateFileMoveOperation()"
Tchanders moved this task from Ready to In progress on the Anti-Harassment (Dalet — ד) board. This also explains why a block's entries in the logs at Special:Block/<BlockedUser> and Special:BlockList are sometimes different. The former is created at the time when the block is originally submitted, so it reflects the block flags in the database. But the latter is dynamically generated, meaning that it has to represent how the block behaves, because of the lack of a mechanism for getting the block properties without Block::prevents modifying them first. The form at Special:Block/<BlockedUser> is also dynamically generated, so it also has to reflect the block's behaviour, and contradicts the block log at the bottom of the page. @Tchanders If I create a block for $user and check "Account creation", if I go to Special:Block/$user "Account creation" is unchecked. I checked that the BlockList shows "account creation disabled", and that in the database ipblocks row for that block as ipb_create_account=1. This was on my local vm (MediaWiki 1.33.0-alpha (5696249) 13:58, 22 February 2019) as beta cluster is read-only atm. As mentioned in T214508, I was worried about regressions around editing user_talk while blocked, so here is a spreadsheet showing the outcome of a users attempting to edit their user_talk page. Each user in each row has a different combination of block parameters, and each IP address they are editing from (one in each column) has a different combination of block parameters as well. The second sheet shows the parameters for each username and IP block. Using conditional formatting as a blink oracle, I can see that the outcome of the users' actions don't change when they do it from a different IP. I am wondering now whether I should test (some of) the extensions which have been patched as part of this task. I note that 4 of the extensions modified above are used in enwp, so I briefly tested 3 out of 4 of them (could not test the last one, see below). 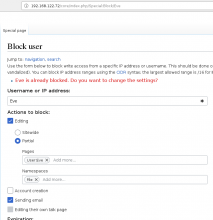 Quickly checked that global blocks still effective and blocked users from user talk and account creation. 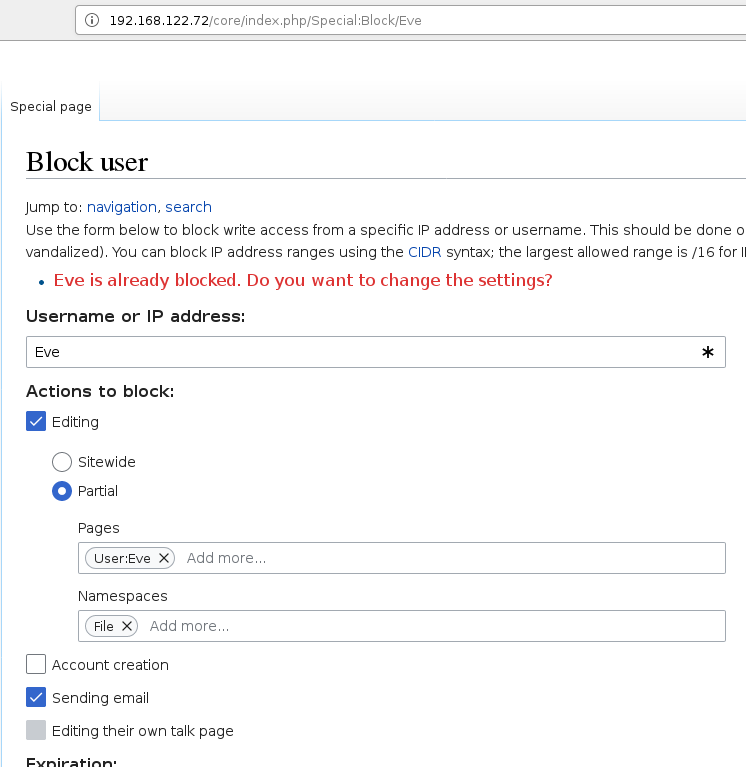 Mass block appears capable of blocking a user, incl. talk page and not email if blocking user does not have rights. Merged two users who both had (partial) blocks. It chose one block over the other. Attempted to use it via test.wiki, but could not work out the endpoint or access the log https://wikitech.wikimedia.org/wiki/Kafka_Job_Queue#Logs. Did not attempt to install locally as it looks quite involved, and I am not sure it is worth the time considering the commit is relatively minor. All tested on MediaWiki 1.33.0-alpha (ffb2ab7) 05:29, 4 March 2019. Please return this to the QA column if you would like anymore testing done. Thank you for being so thorough with your notes! This all sounds good. I think the only other defect in the past related to CheckUser was T208523: Blocks log entries display as malformed on Special:CheckUser which was fixed a few months ago.